Byzantine, Texas: In the Big Apple? 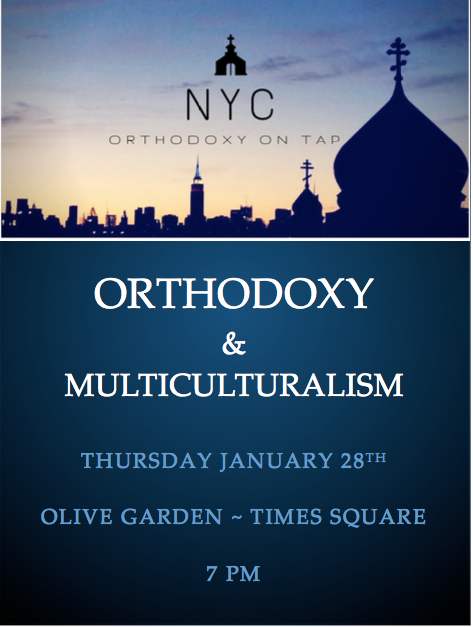 Consider going to Orthodoxy on Tap! In the Big Apple? Consider going to Orthodoxy on Tap! For more information, go check out the Facebook event here! Given the location, guessing this is definitely for the bridge and tunnel set. "On Tap" as in with alcohol? Olive Garden serves alcohol. But surely in the Big Apple one can find a REAL Italian restaurant? Lord, people. The snark is strong in the comments box. I respectfully inquired about the choice of location with one of the organizers and learned that they were looking for a place that a) was in Manhattan, b) had a private room, c) had things "on tap", and d) was willing to take a chance with hosting this event on a Thursday night. It turns out that a lot of restaurants were NOT interested and/or didn't meet the criteria. So, snark all you want, but at least Olive Garden was open to hosting an Orthodox event. If you have an "in" with a restaurateur in the city, get in touch with the organizers and offer your services to help organize a future event. The snark is about the unintentional signaling the choice of location has sent. No one who lives in NYC goes to Times Square if they can help it, and no one goes to the restaurants or bars there unless they are meeting relatives before or after a show. Olive Garden Times Square screams "The organizers of this event are not New Yorkers but thought it would be a cool idea." Also, why Thursday as the only day; it's the beginning of the weekend, from a bar perspective. Given the number of restaurants and bars in all of Manhattan and the number of Orthodox people who live or work in NYC, I can't imagine many establishments were called. The normal way other theology on tap events I've seen do things is to either reserve a table at a bar or just get a group of people together and go somewhere, like a book group would do. A dozen or so people don't need a room and the number of New Yorkers willing to brave Times Square (and disconcertingly jacked-up Times Square chain-restaurant prices) can't be more than a dozen. Full disclosure, I once met a cousin who was on a school trip to NYC at the Times Square Applebee's.